Earring styles go in and out of fashion depending in large part on whether current hairstyles cover or expose the ear. Earring styles go in and out of fashion depending in large part on whether current hairstyles cover or expose the ear. Coral has been popular since antiquity, not only for its brilliant color, but also as a talisman against misfortune. The Coral is natural bamboo coral (dyed a deeper red) and is not under threat of extinction. 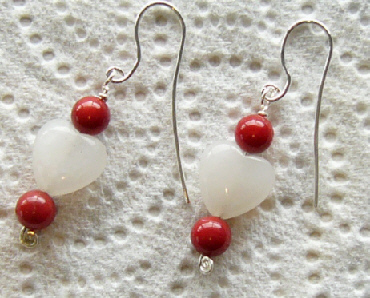 The Snow Quartz hearts are sourced from the US, and the Sterling Silver connectors and ear-wires are handmade on the premises.